The ski areas in Austria are world renown. Whether you are looking for challenging, steep ski slopes or easy, gentle runs, Austria is the perfect ski holiday choice. 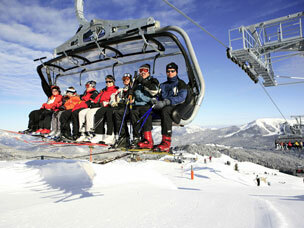 Austrian ski areas are varied with excellent snow cover due to altitudes of over 2000 meters. If winter arrives later than usual, snow cover is guaranteed by high-tech, modern snow cannons. Skiing in Austria is suitable for both beginners and experienced skiers and has always been a favorite ski holiday destination for families with children. The most well known ski area in Austria is the Arlberg Ski Circus which is shared by the ski resorts of St Anton, St Christoph, Lech and Zurs. The other main areas are the Europa Ski Region with great glacier skiing up on the Kitzsteinhorn Glacier, The Zillertal Superski Area which links Mayrhofen and Finkenburg and the Ski Welt Area linking Soll, Scheffau and Ellmau totaling 250 kilometers of wonderful slopes. Austrian ski areas are relatively small and cozy and offer reasonably priced ski passes making Austria a good choice for those looking for a cheaper ski holiday option. One big advantage for those looking for more extensive skiing is that these smaller ski areas are often linked to larger, more complex areas offering a wider choice of ski slopes for all levels. Austria has long been one of the most popular ski holiday destinations with British skiers who flock to the Austrian Alps each year attracted by the varied advantages. In Austrian ski areas, you will be spoilt for choice whether your favourite winter sport is skiing, snowboarding or cross-country skiing as Austria is home to a wide variety of resorts that cater for all levels of skiers, snowboarders and cross-country skiers. The SkiWelt Wilder Kaiser - Brixental Area is the largest in Austria, linking the ski resorts of Söll, Scheffau am Wilder Kaiser and Ellmau. Here you will find nearly 280 km of slopes. The Zillertal Arena lives up to its name offering 225 km of ski runs linking the ski resorts of Hippach, Mayrhofen and Finkenberg. 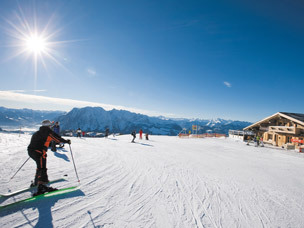 The Ski Juwel area, which now links many smaller ski resorts with Alpbach, boasts 145 km of slopes. 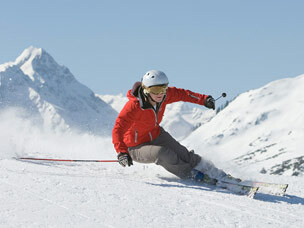 The best ski areas in the Austrian Alps for snowboarding are in the Tirol region, to the west bordering Switzerland. The huge Zillertal ski areas offer some of the best freeriding in Europe. Whether you’re an on-piste snowboarder or a daring powder hound, snowboarding in Austria offers everything from huge powder bowls to long, wide, perfectly-groomed slopes. If extreme snowboarding is your thing then you’ll be in heaven in the Austrian ski areas. For freestylers, Austrian ski resorts don’t offer the best pipes and parks in Europe although many resorts claim to have plans in the pipeline! In the region of Styria cross-country skiers have the choice between 15 dedicated areas with perfectly prepared trails which have been awarded the cross-country skiing seal of quality. There are over 30 specialised cross-country skiing hotels in this region which offer everything you could need for your cross-country skiing holiday, including sports therapists and spa treatments. The ski resort of Forstau in Styria has a particularly good reputation. In the Salzburg region, in particular in the SSkiregion Dachstein-West area, the cross-country skiing is exceptional. With some 4,000 kilometers of Nordic ski trails, the Tirol region provides endless options for cross-country skiers of all levels with excellent accommodation just steps from the trails.